We're teething...well, we have been teething for months, actually. I think we're in the second stage of teething. Did you know that there were 5 stages of teething? It's true. Some babies start to cut their gums before 6 months, but the drooling can start much earlier still. It's not a fun time for babies or parents and can mean irritability, problems eating, sleeping and general discomfort to extreme pain. Recently I was able to test Caaocho teethers -- well, Madeline was able to test them. We are in stage 2, as I said, one tooth poking out and more coming soon. I can feel it. And I'm sure she can, too. Between the drool and the cries, the hard gums and the chomping at every possible bit, I know another chicklet is on her way. Caaocho teethers are made of 100% pure, natural rubber that is chemical-free, eco-friendly and designed in Canada. The teethers and toys support baby through all the stages of teething, from early incisors to more challenging last-molars and come in a variety of cute shapes and animals. 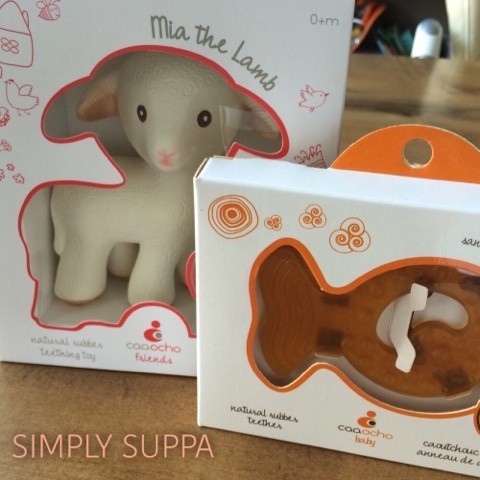 Maddie has been playing with Mia the Lamb and the all-stage Teether Fish for weeks. On first glance, the all-stage Teether Fish doesn't look like anything special. It's a natural rubber, so it's not a bright colour, but once you take it out of the packaging, you'll notice a variety of fun textures to stimulate baby's mouth. This teether is free of any colours and pigments. Bonus. I like the cut out in the fishie -- it makes it easy to attach to hooks for the car or stroller and allows Maddie to hold and position easier. The Teething Fish can also be frozen or cooled in the fridge for calming inflamed gums. And Mia the Lamb, what can we say? She is oh, so cute. Again, made of 100% pure natural rubber, certified BPA, PVC, Phthalate- and Nitrosamine-free and painted with food-grade paints. Mia is the perfect size for little fingers and mouths; she has a lovely squeak that isn't annoying or shrieking and also has different textures on her body to aid tactile exploration. I like that Mia's body isn't too long or lanky, so her body parts don't get stuck in a baby's mouth or throat. Caaocho Teethers and Toys are available at Mastermind Toys and range in price from $11.99-19.99. They make a great gift, too. Mastermind Toys has generously provided Simply Suppa with a $50 gift card to spend in store -- on Caaocho, or otherwise! To enter, fill out the Rafflecopter details below. I'd get my baby boy something from Melissa & Doug and maybe one if the Caaocho teethers too! They have a lot of great stuff...it's hard to choose! I would love the Caaocho teethers for my son! I would get the B. Ready Beach Bag & a Caaocho teether! I would use the money towards a plasma car for my son.